This article is about the guest star. For the character, see Lance Armstrong (character). 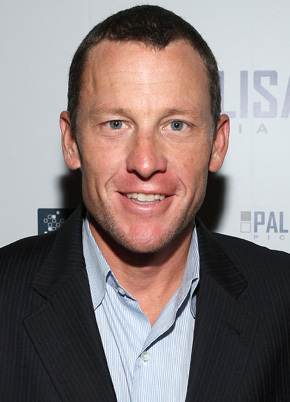 Lance Edward Armstrong (born Lance Edward Gunderson; September 18, 1971) is an American former professional road racing cyclist. His winnings included the Tour de France victories for the seven years 1999 to 2005. However in 2012, he was banned from cycling for life for using and distributing performance-enhancing drugs and was stripped of all titles. He voiced himself in the season 19 episode "Mona Leaves-a".